The Ancestors MCC Annual Toy Run from Ballygowan saw a large contingent of bikes, scooters, mopeds, trikes and sidecars head off to the Ulster Hospital Children’s Ward in bright sunshine and freezing temperatures. The run escorted by the PSNI motorcycles, stopped off at Sainsbury’s trailer park Sprucefield and then on to Custom House Square Belfast for a stop before heading to the Ulster Hospital, for a warming cup of soup and a great spread of food. A total of £1700 was raised along with a small mountain of toys for the children’s ward. Heather Barr from the Ancestors MCC, said, “Thank you to all those who came out to support the Ancestors Toy run. 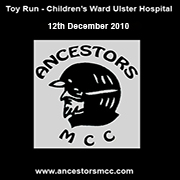 The generosity of all those who took part in the run and also of those clubs and individuals who could not make it but sent toys and money, was greatly appreciated by the staff at the Ulster Hospital. Thank you Ancestors MCC for all the hard work behind the scenes and on the day! Looks like a great day was had by all, as usual. Sorry Derek and I couldn’t make it.